The main aim of any diabetes diet must be to normalise blood glucose and, incidentally, blood insulin, as these two together are responsible for the complications of diabetes. "The main aim of treatment of both types of diabetes is to achieve blood glucose, blood pressure and cholesterol levels as near to normal as possible. This, together with a healthy lifestyle, will help to improve wellbeing and protect against long-term damage to the eyes, kidneys, nerves, heart and major arteries." Diabetes UK then tell you to base your diabetes diet around starches such as bread, cereals, pasta, rice, fruit and vegetables. All of which contain carbohydrates, in many cases in very large amounts. 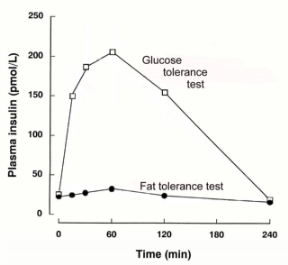 However, you will remember from the two graphs below, which we saw in 'How dietary carbohydrates cause weight gain', that these foods are the very ones that raise both blood glucose levels and blood insulin. This is the last thing you need in your diabetes diet! 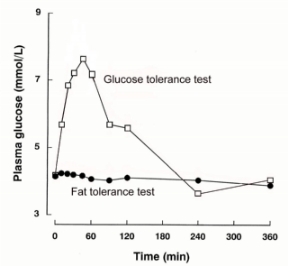 Isn't the aim of any diabetes diet to control blood glucose and insulin within the normal range? Diabetes UK's advice will make that very much more difficult, if not impossible. Not surprisingly, if you follow Diabetes UK's 'healthy' carbohydrate-based diabetes diet, whether or not the carbs are low-GI, you will get the worst glucose and insulin control. So cut down on carbs, especially the starchier and sweeter ones. Breakfast cereals are probably the unhealthiest foods not just for a diabetes diet but also in the Western diet as a whole. Bread, pasta, rice and other foods made from cereal grains are also a no-no.